This Sunday, Conor Coady will emulate his idol Steven Gerrard by playing at Wembley in the biggest match of his career to date. The 21-year-old looks set to start for Sheffield United as they take on Hull City in the FA Cup semi-final. 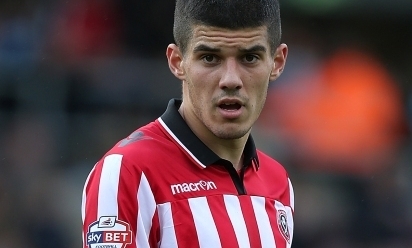 Since the appointment of former Red Nigel Clough at Bramall Lane, Coady, who is on a season-long loan with the League One outfit, has been a regular in the heart of the midfield and is flourishing in a new attacking role. Conor, a Wembley appearance beckons in the FA Cup semi-final - how much are you looking forward to a first senior appearance at the home of English football? It's going to be a fantastic weekend for the whole club and the whole city, the supporters and everything. All the players are really looking forward to it and it's something we are all going to give our all for. What are your previous experiences of Wembley, as a player or a supporter? I've been a couple of times to Wembley to watch Liverpool. I went for the League Cup final against Cardiff City and the FA Cup semi-final against Everton, which were fantastic experiences. When we won the U17 Championships with England, we had to take the trophy onto the pitch at Wembley during an England senior game, which was great. It's a fantastic place to play. I can't wait for it and it's something we are going to relish massively. For me to play there will be a fantastic experience. With this game being a few days before the 25th anniversary of Hillsborough, the players will be wearing black armbands as well - how emotional will that be for you? Being a Liverpool fan since I was a kid and playing for Liverpool since the age of seven, it's going to be a massive day for me. Everyone at the club knows about Hillsborough and it will be a huge day. There was an incredible atmosphere at Bramall Lane when you beat Charlton in the quarter-finals. Where does that rank in the best experiences of your career to date? It's the best atmosphere I have ever played in front of. Everybody knows Sheffield United supporters are very passionate about football and their club, and that day was unbelievable. Hopefully there will be some more days like that and the club can push on now and can keep on giving the fans those days. I'd like to think they have taken to me quite well but it's just about me keeping on producing performances. Hopefully I can carry on doing that and keep playing well for them. You must have plenty of people badgering you for tickets - will your family be at Wembley to cheer you on? Yes. I think I've ordered about 30 tickets, so there are quite a few of my family and friends going. It's going to be a great day for everyone. Have you dared to consider what would it mean to reach the final? I've thought about it and I think you would have to be daft if you didn't. It's a massive day for us and we are going to enjoy it no matter what happens, but we will go in there and play the way we can and hopefully we can get a good result against them. What is the spirit like in the camp ahead of the game? It's fantastic. Everyone is excited and we are going to relish the opportunity. For us, going up against a Premier League team like Hull, it's going to be a fantastic experience for us and it's good to test ourselves against the best players. We are going in there to play our own game and hopefully we'll come out with a good result. You have already eliminated one Premier League team from the cup in Fulham. Do the players have confidence that you can repeat the trick against Hull? Yes, of course. When we played Fulham we went into the game to make sure we were very tight and compact and to try to catch them on the break, and I think that's what we might do. We will play our own game and see what happens but we will enjoy it. We know it won't be easy. Steve Bruce is a fantastic manager and he's done a fantastic job this season. It looks like they will be safe this season, so for us to come up against a side like that can only be good for us to test ourselves. There's a former Liverpool player at the helm of the Blades - Nigel Clough. What have you learned from him since he took over as manager? He has been absolutely fantastic for me. He came in just before Christmas and he told me what he wanted me to improve on and get better at. I feel like I have done that and there's still plenty more room for improvement. He is helping me every day and I really owe a lot to him because he has brought me on as a player. He has a long-lasting affinity with the Reds, with some memorable moments as a player. Do the pair of you ever talk about the club? I speak to him quite often about Liverpool and how well they are doing in the Premier League. He has been fantastic and told me stories about his days at Liverpool. And former Liverpool starlet Ryan Flynn scored one of the goals in the quarter-final win over Charlton. How impressed have you been with his performances? Since I came to the club he has been fantastic with me and you can tell he is a top player and he will do very well in the game. He is very direct and you know if you give him the ball he will beat the full-back and get a good ball into the box. He has been fantastic for us this season. How much do you feel you have benefited from this loan spell at Sheffield United? It's been massive for me. At the start of the season I spoke with the club and my family and it was something I really needed. I had played reserve-team football for a couple of years and I needed to step out into the big world to play the man's game. I have really enjoyed it and it has brought me on massively as a player and as a person. How much have you improved as a player since last summer? Would Liverpool fans be surprised? Maybe they would, I mean it was up to me to go out, learn my trade and play as many games as I could. The gaffer has been superb with me and he is playing me in a role high up the pitch just behind the strikers in the midfield. I've really enjoyed it and I do feel I have improved as a player. You have mostly played in midfield for the Blades this season, but were often at centre-back with the Academy. Do you see midfield as your position long-term? Yes. Playing higher up the pitch is something I really enjoy, trying to get forward and trying to get into the box. The manager has been pushing me to get into the box and I'd like to think central midfield will be my position. You have added goals to your game this season - has that come from playing in a more advanced position? I've scored a couple. Since the gaffer has come in he has been trying to get me in the box and luckily I have done that. For me now it's about getting into the box, trying to time my runs well and hopefully I can get a few more. Maybe a goal at Wembley? You never know, you never know. It would be nice! When you look at Steven Gerrard and the role he is playing in the team now how much does that inspire you? Steven has always been an inspiration to me. Being a Liverpool fan all of my life, he is my idol and a hero of mine. I always try to come back here and watch him play because I learn so much off him and hopefully I can carry on doing that. We know Brendan Rodgers keeps a close eye on the club's youngsters - has he been in touch ahead of the big game? I spoke to him a few months ago and he was fantastic. He also dropped me a little text, which I was made up about as it's something he didn't have to do. To get a text off the Liverpool manager is fantastic. Mike Marsh also keeps in regular contact with you doesn't he and watches your games when he can? He does. He watched me play against Brentford last week and I appreciate that. I speak with Marshy quite often and he is brilliant with me. And have any of the players from Liverpool sent you messages of good luck? I speak to the lads from the U21 squad all of the time. They are my friends and I have grew up playing with them. They are fantastic lads and I text them as well, asking how they are doing. You are in regular contact with U21s manager Alex Inglethorpe. How highly do you rate his coaching and what have you learned most from him? Alex has been fantastic. Since he came into the club he has always tried to improve me as a player. He has helped me a lot and I have learned so much from him. I come to the Academy quite a lot still to watch my little brother. Alex is doing a fantastic job for the club. You were at Anfield as a supporter for the Tottenham game - that was some atmosphere, wasn't it? That was fantastic and I try to get back as much as possible. Liverpool is the club I love and support and hopefully I can get back for some more games during the run-in. Looking beyond the current season, what's next for you? What would it mean to you to be a part of this Liverpool team one day? I have been a Liverpool fan all of my life since I was a baby and to step out on this pitch is a real honour for me. It would be a really proud moment for me to play for Liverpool's first team at Anfield, but at the minute it's about me knuckling down and trying to play as well as I can for Sheffield United and push on.